There are some comics creators immediately recognizable beyond a visual style, revisiting the same themes and tropes and in some cases even telling the same story. Becky Cloonan is not one of them. Though it’s easy to pick her art out of a lineup if you know what to look for, her writing over the last few years has carved a wider swath than most, linked only by her penchant for complicated, nuanced female characters and eye for the best of what horror has to offer. With Gotham Academy, Southern Cross, and Punisher under her belt, Cloonan has proven as adept at playing in someone else’s sandbox as she is working on her own stories. Each of those books is remarkably different in tone and subject matter, though they do share the link of Cloonan’s love of things that go bump in the night. Back in 2011, she self-published a collection of three comics that showed just how skilled she is at twisting familiar tales of fear into something unique and entirely new, using terror and desire to pull readers along with her. The new reprint of By Chance Or Providence (Image) includes not only those three stories colored by Lee Loughridge, but also a sketchbook with works in progress and character designs as Cloonan worked through the book. Each of the works is rooted in legends that are almost universal; Wolves revolves around werewolves, The Mire an almost Arthurian depiction of the danger of duplicity and jealousy, and Demeter is about the things that cannot escape the sea. They’re all set in a nebulous past where chainmail and swords are common and fealty is pledged to people with titles like lord and knight. True to form, these are all horror stories, built not out of violence and gore but fear. Cloonan often addresses the terrible things that human beings do to one another, and By Chance Or Providence is steeped deeply in that habit. There are no easy answers, of course, but lots of room for love, both platonic and romantic, and particularly parental. 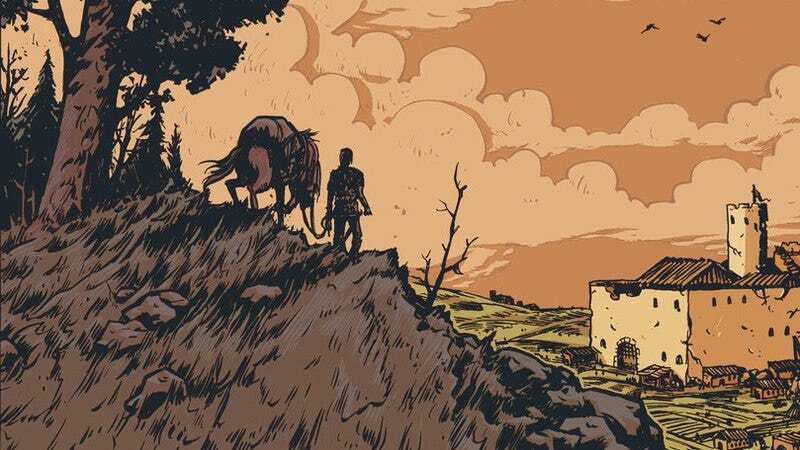 But affection can also push people toward desperation, and Cloonan does an excellent job of exploring that. The real draw here, especially for folks who aren’t normally into horror or period pieces, is Cloonan’s art. Her style has continued to evolve in the last six years, but the comics are recognizably and undeniably hers. When originally published, the book was in black and white and could certainly have been reprinted that way, but Loughridge’s colors, not quite monochromatic, are just as intentional and impactful as they are on Southern Cross. The best way to describe Cloonan’s art is perhaps Pre-Raphaelite: there is both delicacy and brutality, the same kind of lush backgrounds and organic shapes as painters like Edward Burne-Jones. Characters don’t leap off the page as much as they complete and center their environments, deeply suited to where they are. Much of Mech Cadet Yu is familiar. The lead character looks like Ash from Pokémon, and the giant robots are heavily influenced by the designs of classic mecha properties like Mazinger Z and Tetsujin 28-gō with a splash of The Iron Giant. But that familiarity works in the story’s favor. Writer Greg Pak, artist Takeshi Miyazawa, and colorist Triona Farrell craft a charming tale of early adolescent ambition in Mech Cadet Yu #1 (Boom! Studios), a debut that is highly reverent of the genre’s past and seeks to capture the style and earnestness of those early stories. Stanford Yu works on the cleaning crew of a prestigious academy that trains cadets to work with the alien Robo Mechs that visit Earth every four years, and he dreams of becoming a member of the Sky Corps. Pak blazes through exposition at the start with a speech from a Sky Corps instructor explaining the fundamentals of this world, and while it’s not the most graceful info-dump, it quickly sets the stage so the creative can get to the meat of the story. The robot designs are largely responsible for this book’s retro feel, and there’s a warm sense of nostalgia that emphasizes how deeply the team is committed to the genre and creating that sense of naive wonder they felt when they absorbed giant robot stories at a younger age. Stanford is driven by that wonder, and when he gets the opportunity to have the life he’s fantasized about, he immediately seizes it. The final page is when the shape of the larger story becomes clearer, revealing a new mecha with a design reminiscent of the more angular, severe mecha of Neon Genesis Evangelion. That stylistic shift suggests that the book is saying something deeper about how giant robot storytelling changed over time, with the genre drifting away from its innocent roots to explore more mature themes. Pak touches on some deeper political issues when Stanford is bullied by students for speaking Cantonese instead of English and his mother tells him that their low social class forces them to work five times harder than everyone else, and incorporating these heavier themes into an otherwise light, breezy story makes for a more substantial read. Pak and Miyazawa created Marvel’s Amadeus Cho, teenage super-genius/current Hulk, over a decade ago, and both creators have grown a lot since then. Pak’s experience in superhero comics—specifically on Marvel’s Hulk titles and DC’s Superman—has taught him how to craft spectacular stories that still have relatable character stakes. Miyazawa has refined the action and emotional content of his art with each new project, doing especially rich work on the most recent volume of Ms. Marvel. His slickly detailed inks, dramatic composition, and bold character expressions make Mech Cadet Yu very engaging on a visual level, and there’s going to be even more to appreciate once the action kicks into high gear. Farrell’s coloring adds dimension to the linework with shadows, but she keeps the rendering mostly flat, which reinforces the old-school aesthetic. This art team is an ideal match for Pak’s story, and the chemistry is undeniable in this opening chapter. The character Spy Seal, describing a painting, remarks: “It’s modern in content and style, but it feels like it was painted centuries ago,” which is a description not far off the mark of Rich Tommaso’s latest, Spy Seal: The Corten-Steel Phoenix #1 (Image Comics), a blend of modern content and older aesthetics. The first issue eases readers into the world of Spy Seal, a rough-and-tumble adventure serial that stars an unnamed anthropomorphic seal taking on Russian spies. The series takes place in ’60s England, and this first issue doesn’t actually feature any spying on the part of the titular seal—though that promises to change by the next issue. But while the set-up seems as enjoyably straightforward and simple as it is playful, the real appeal of Spy Seal is Tommaso’s ability to work in the same visual dialect as ’60s Franco-Belgian adventure comics like Tintin. The issue’s title page—from its font, to its layout, to the circular illustration—invokes Hergé’s seminal comic series, and it’s a pastiche that Tommaso weaves throughout the issue. Tommaso has long favored simple, clean lines and clear, uncluttered compositions, so folding an overt Hergé pastiche into that aesthetic works seamlessly. Some aspects of this pastiche are quite subtle—the density of the pages, and the preponderance of thin, tall panels—while others, such as the distinct style of word balloon, are more noticeable. But Tommaso doesn’t give himself totally over to his homage, and he distinguishes himself by retaining his more simplified backgrounds and more saturated colors. The high number of panels per page, in addition to the balance of talkative sequences and silent ones, makes this first issue exceedingly dense. But, as far as first issues go, this one is quite good. There is a lot of set-up, but Tommaso successfully situates readers in a particular time, a particular place, and sets himself up to really dig into the premise of the title in the following issues. These aesthetic choices firmly places Spy Seal in a milieu of fun and levity, and it reads like a throwback to a bygone era of uncomplicated, direct storytelling. It’s fun in a way so few comics these days are, and that offers readers a particular satisfaction. The whole thing is a refreshing reprieve from the more overly-complicated serials that traffic in an endless series of twists. Rather than winking cleverly at the audience ad nauseam and passing that off as wit, Tommaso takes a simple idea and he executes it directly—with sincerity, humor, and attention to craft—to delightful results.